Looking for a BillyOh Apex Bike Store? 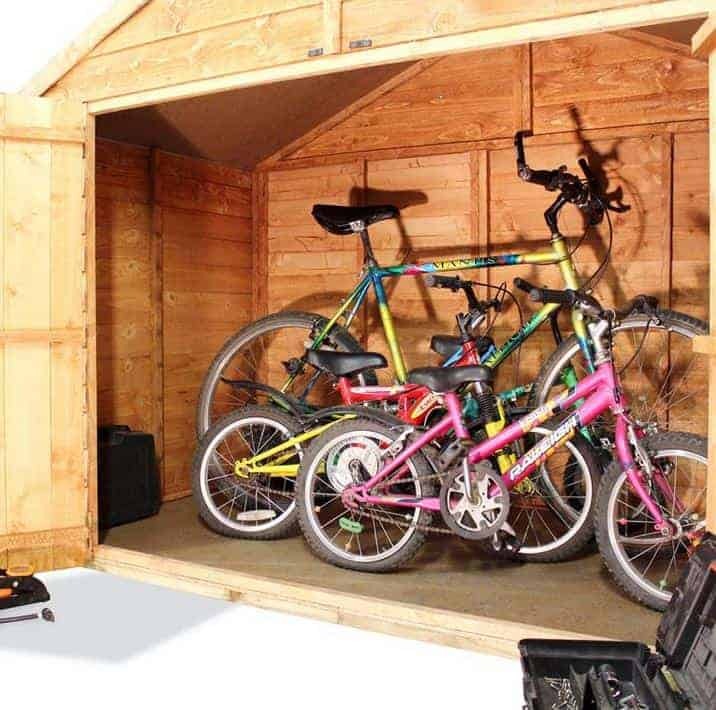 Store the whole family’s bikes in one place for easy access whether on a daily or more casual basis. This attractive timber overlap cladded bike store is spacious enough to hold everyone’s bikes and even the odd scooter and skateboard too. If you’re a bike fan or your children spend hours outside riding around then this is perfect for you as it will keep your bicycles clean and dry plus it looks great. Not just for bikes or scooters, of course, you could use it for other garden or outdoor equipment such as the BBQ or children’s toys and it has excellent large double doors for ease of transporting your bicycles or equipment inside and out. Made from sturdy wood so it will last for years and the tongue & groove, rustic or overlap cladding gives it extra strength. It is an attractive looking storage building which will prove hard wearing even in the worst of weathers. Available in other sizes too to suit your particular bike storage requirements. With the opportunity to add a padlock or similar security fitting (both sold separately) you can have the peace of mind that your bikes are secure whilst not in use. These days they seem to have a storage solution for everything and Billyoh have definitely designed this bike storage shed with bike owners in mind. 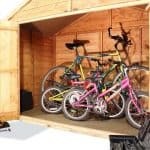 Below the team at whatshed.co.uk look at the specific features and aspects that make this bike storage shed superior to storing your bikes in a traditional garden shed or garage. Exterior: An attractive timber cladded exterior and apex roof give this bike storage shed the feel of a traditional shed whilst being specifically designed with features for bike storage. The high quality, thick timber will protect your bikes inside from the elements and damp, rust and mould, keeping them in top condition. Interior: The spacious 4×7 interior floor area is large enough for a whole family of bikes or if you simply wanted to use it as storage for your garden and outdoor items that would be suitable too. Shelves may be added to create further storage for all those biking accessories such as helmets, bike pumps and the like, keeping everything neat and organised. Doors: The extra-large double doors cover the entire front of the storage shed meaning that when they are open you can see everything in the shed at once. Access to get bikes in and out of the shed on a regular or sporadic basis is fantastic and no hassle at all. Security: We understand that when storing lots of bikes you may be concerned about security. 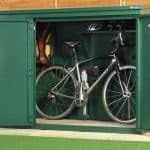 There are no security fittings provided in the bike storage shed package, although a padlock set is available to buy separately at a modest cost. 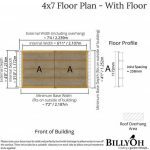 The Billyoh Bike Storage Shed 4 x 7: How easy to build? The Billyoh bike storage shed is easy to assemble and we expect that you could easily have it built and storing your bikes within a day. 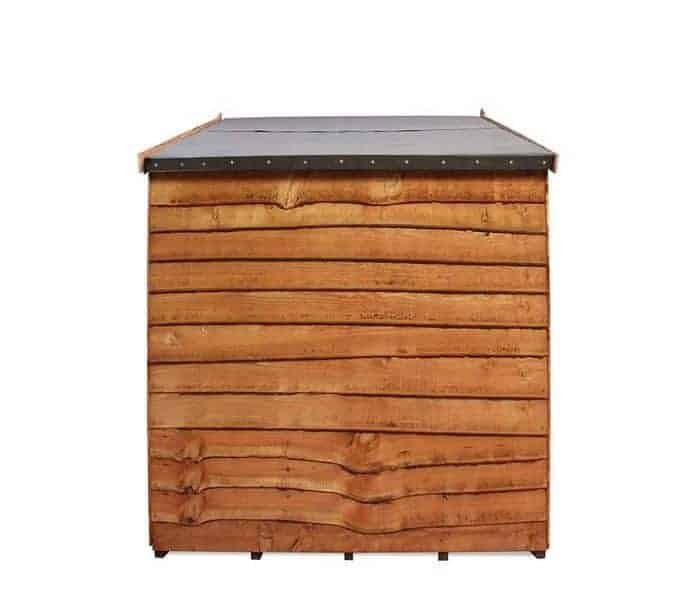 Your bike storage shed will be delivered directly to your door in a flat-packed package with all the timber panels, roofing, fixtures and fittings required for assembly. All that you will need to provide is a basic set of tools and maybe an extra person to help you build your storage shed if needed. 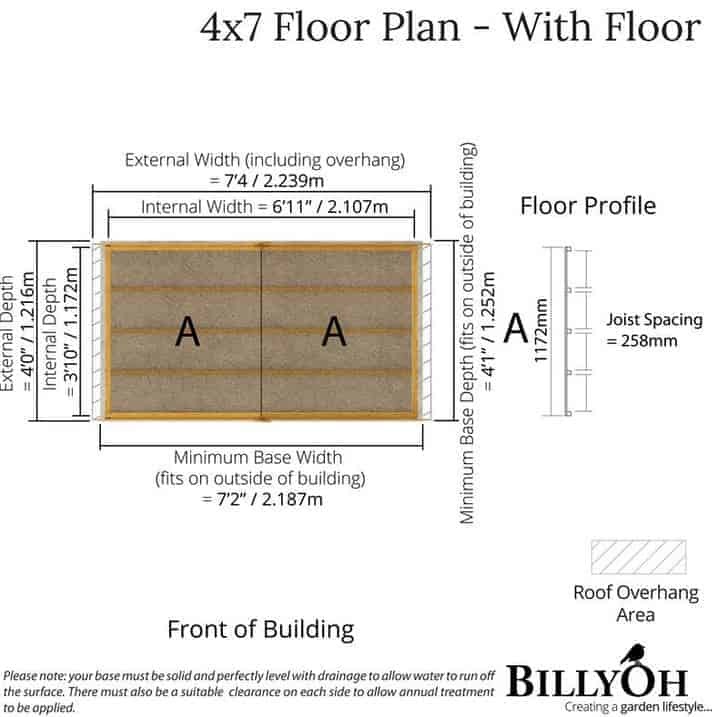 Although it may be possible for an individual to build this shed, Billyoh recommends that you work together with another person, not only for safety reasons but also for efficiency and best use of your time. Full instructions are provided. 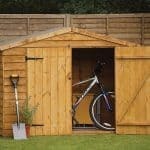 The Billyoh Bike Storage Shed 4 x 7: What is the overall quality like? Throughout its impressive range of garden buildings, Billyoh maintains a high standard of workmanship, combining stylish designs with quality, hard wearing materials. The Billyoh bike storage shed is sure to protect your bikes all year round, whatever the weather; with its thick cladding no weather will beat its tough exterior. Your bikes will be kept dry and secure from the elements and rust and mould, keeping them in tip top condition for when you come to ride them. 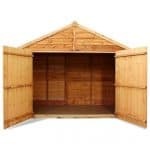 It is recommended that you apply a preservative treatment to make the timber last as long as possible but other than that this shed is fairly low maintenance. If you wish to clean your bike shed simply hose down with water and leave to dry – simple as that. 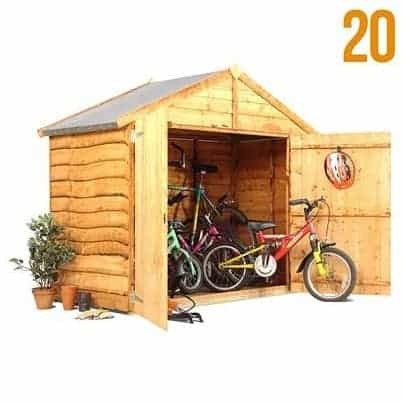 A fantastic looking storage shed designed specifically for storing your family’s bikes in a protective and secure environment all year round. The 4x7ft interior is the largest available within this particular range and can hold even the biggest family’s bikes and other wheeled items such as scooters and play cars. 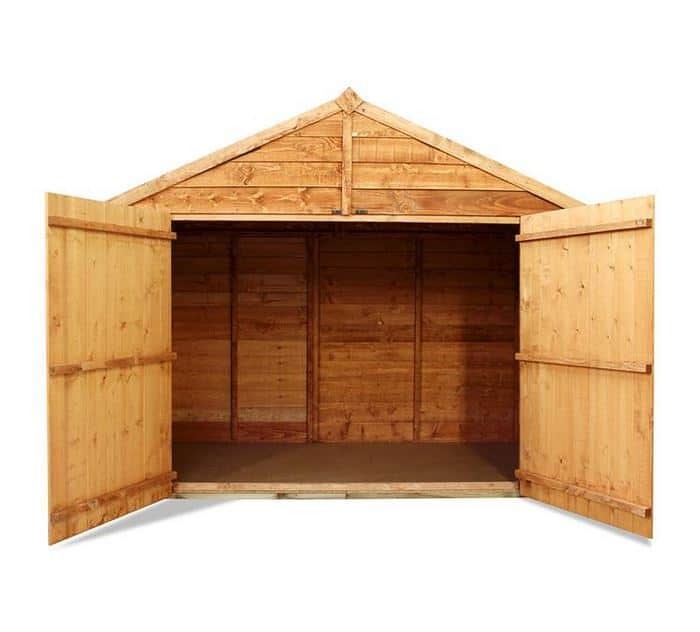 At such a fantastic price, this shed will become a much-loved feature within your garden that will be used by the whole family time and time again for many years to come. 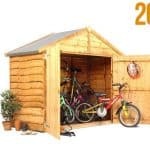 Could you tell me how bikes the shed will hold, I want to store 3 adult and 1 child bike? At only 4 foot wide that might be a bit of a push. I think you should go with something wider.